A computer system organizes all of its files in what is called a directory structure. The directory structure itself resides on what is called a partition – a low-level structure in which files and directories reside. Each directory contains information such as the name, location and size of each file. / is the root directory where the directory structure begins. Every file and directory in the system is under the root directory. /boot is where Linux keeps files and information needed for booting up. It contains vmlinuz which is the kernel. /etc contains the configuration files for the system. /etc/fstab contains descriptive information about floppies, CD-roms and so on. /bin, /usr/bin contain the most important programs (binaries) that the system needs to operate, such as the shells, ls, and grep. /sbin, /usr/sbin contains system admin programs which can only be run by the root user. /usr is the directory that stores user applications and is usually the largest directory. /usr/doc contains documentation for user apps. /usr/share contains configuration files for user apps. /usr/src contains source files for user apps. /usr/include contains header files for the C compiler. /usr/local is where apps and files are housed that are strictly on the local machine. If the machine is on a network, the /usr directory may be physically in another location, so /usr/local contains only the information that should be on the local machine and not shared by other access points in the network. /home is where the users keep their personal files. /root is the super user’s home directory. /var contains variable data that is constantly changing while the system is running. /var/log contains log files like error reports. /var/mail – incoming/outgoing mail is stored here. /var/spool – holds files that are queued for some process, like printing. /tmp contains temporary files written by programs. /dev holds the devices that are available to the system, like floppy disks and cd-roms. /mnt is a directory used for mount points. The different physical storage devices must be attached to some directory in the tree structure before they can be accessed. /proc is a virtual directory that contains information about the kernel. /lost+found is where Linux keeps files after a system crash. 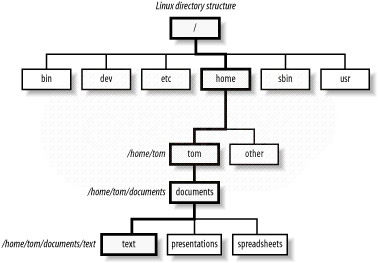 The linux hierarchy of directories.